← 76. Meldrum House. 19 June 2018. 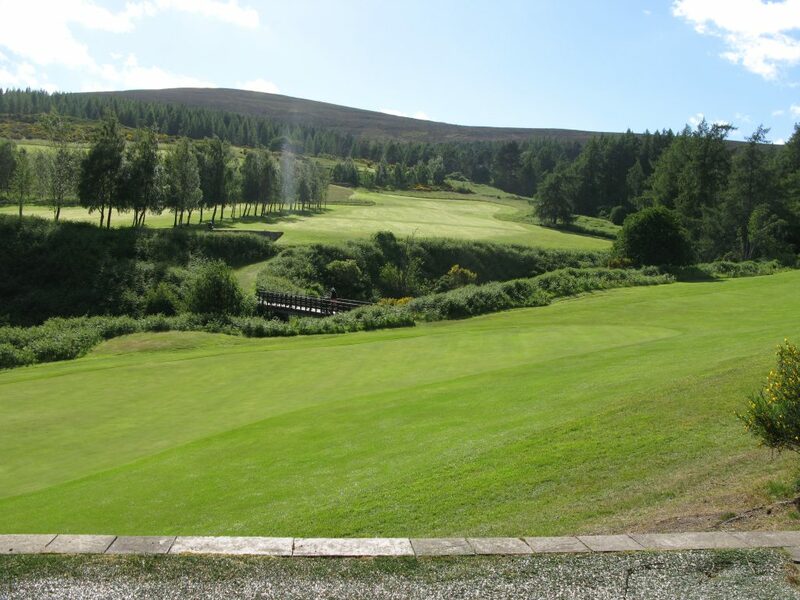 Dufftown has a variety of claims among UK golf courses; highest hole (9th), biggest drop from tee to green (10th) and highest climb from clubhouse to top of course. You probably get the picture. If you are looking to play an occasional bit of holiday golf with young kids, treat them to a buggy to avoid the inevitable “I’m tired” conversations after 9 holes. Thankfully, buggies are available for hire at this course! Moly at the 6th tee at Dufftown on a beautiful mid-summer evening. 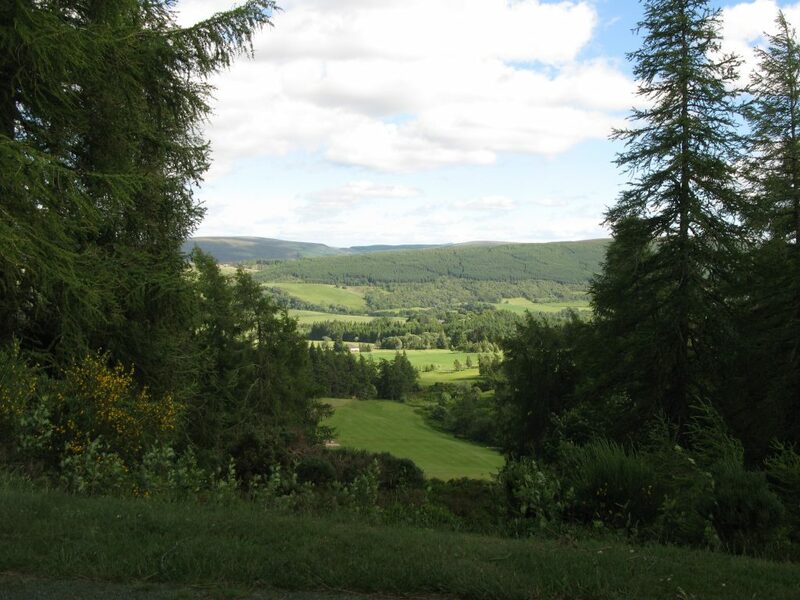 Dufftown is well worth a visit for a variety of reasons. It’s the “whisky capital of the world” and home to William Grant & Sons distillers, producer of the biggest global selling single malt whisky, The Glenfiddich. There are still traces of the early Picts and Christian communities dotted around Dufftown, so historians are also well served. The pure local water made it a good location for illegal whisky and there are numerous villainous stories related to that. The golf course also has some villainous holes ready to capture and destroy your round. Although short at only 5343 yards (white), 4751 (yellow) and (4900) red, there is great variety here. There are many severely uphill or downhill holes and the stroke indexes don’t necessarily follow the normal “length = difficulty” rule. There are several blind tee shots and the greens are often on plateaus with dangerous surrounds. All in all, its going to be difficult to avoid a calamitous hole over the round. The 10th, the signature hole, is a great example. 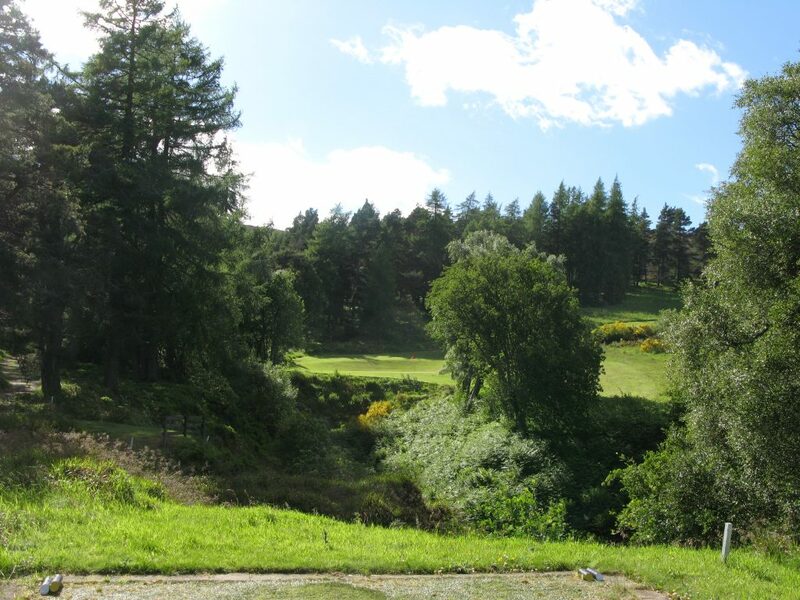 Although the landing area is large, the view from the tee is intimidating, then the second shot needs to be played into a ever narrowing channel, to a long and thin green, with OOB all along the right of the left to right sloping fairway. Record a par 4 and be delighted, record a 5 and be happy to move on. I took a great triple bogie 7, having lost my drive (2 shot penalty), going through the back to a lateral hazards with my approach (1 penalty), then having a good chip and single putt! 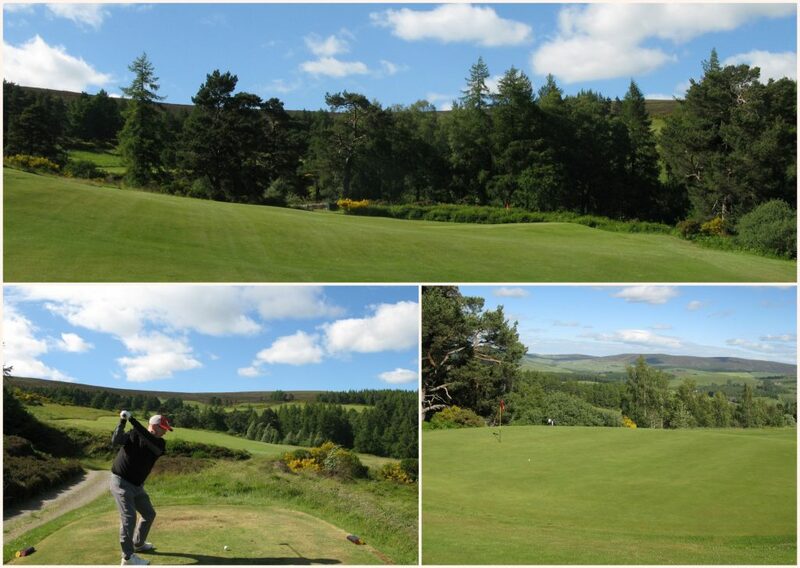 The course has one of the shortest holes in Scotland, the 7th (“Fittie Burn”), at around 100 yards, played over a deep gully. As it was a nice day and we were pretty much alone, I spent 5 minutes looking for balls in the ravine, and found about a dozen – my hay fever took a battering though! The course was in wonderful condition and the greens true and even, albeit they had “lost” the 12th green, which was, according to the local green keeper, due to severe frost damage over the winter. I had a good day shooting 83 including a birdie 3 at the downhill 9th. 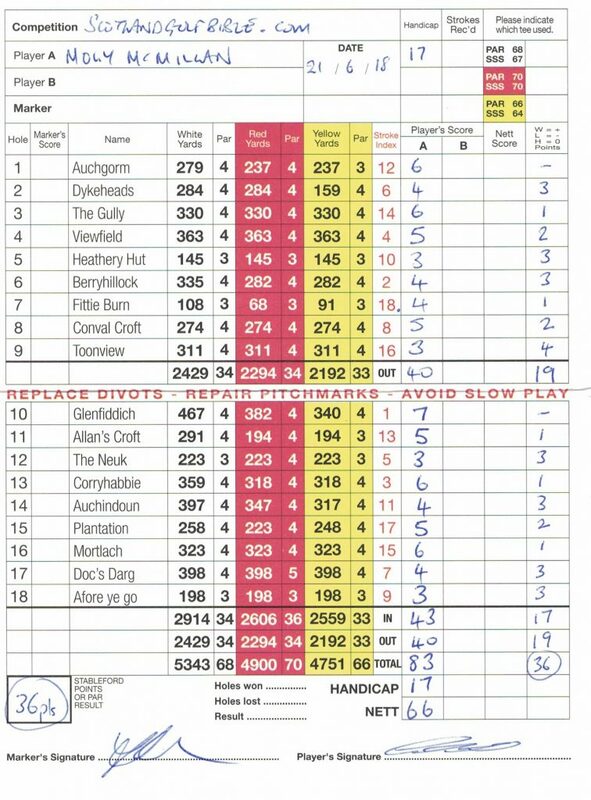 Moly’s Dufftown card – 83 for 36 points. This entry was posted in 18 holes, 1851 - 1900, 4 star, 5 star, Course Architech, Course Owned By, Course Quality, Course Type, Heathland, Holes, Members, Overall Value, Price, Region, The Highlands, Unknown, When Course Established, £20 - £39. Bookmark the permalink.